We have now set the dates for our 2019 Tournaments and have opened it up for booking entries. Please see our tournaments page for more details. A huge Thank You, to all our Club Sponsors for the Season 2018/19. Interested in becoming a 'Partner Sponsor' ? See the sponsor pages for full details. Powerleague Milton Keynes, is a partner sponsor of WWFC. Powerleague MK is the number 1 place to host your child’s party. Football parties are always a huge hit with the kids and if you want to ensure yours is memorable, choose Powerleague MK. Entries now open for our 2019 Lions & Lionesses Tournaments, which will be held on the weekends of 22/23 (Lionesses) & 29/30 (Lions) June 2019. 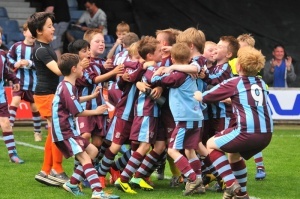 Please visit our Tournaments page to find out how you can be part of it. Nearly 500 boys and girls of all abilities playing for approaching 40 teams (5 years of age through to adult as well as “Goalability” pan-disability sessions). Watched and supported by around 1,000 parents. Along with family and friends, a regular audience of some 7,000 adults living mainly in South East Milton Keynes and West Bedfordshire. 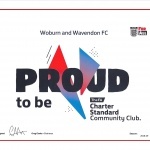 Non profit-making and 100% volunteer run, Woburn & Wavendon F.C. is an F.A. Charter Standard Community Club. Accredited with Community Club status means the club is among the country’s best; proven to be well run, sustainable and places child protection, quality coaching and safety as paramount. A true testimony to our success is that new generations of many former players keep coming back to join our teams. Indeed, you can be assured that the Club is also hugely respected within the football world too. “WWFC is without doubt a shining example for grassroots football clubs everywhere” – Luke Harman, FA Partnerships Manager. Most of all, The Lions & Lionesses are ALL ABOUT HAVING FUN. We aim to help all our players develop their full footballing potential, make friends and enjoy loads of smiles along the way. So whether you’re a player, coach, volunteer, relative or sponsor, we hope you like what the website has to show you, but more importantly are stimulated to “get involved and join in with all the fun”! April 6, 2019 Investing in Grassroots...Literally! April 6, 2019 COMMUNITY CLUB STATUS ACHIEVED!! April 1, 2019 Playing opportunities with our U14s (Year 9). April 1, 2019 The dates have been set for the U16 Cyclones Cup Finals! March 22, 2019 Lionesses make the final!